Here is an article for the very beginners. This is not an article about actually teaching a parrot to step up, refer to this one for more information about actually training this. This one is about the actual approach to requesting a trained parrot to step up. This is great for members of a household that has a parrot that steps up but want to know how to hold it, folks who bought a tame baby parrot and want it to step up, and just anyone wondering about good ways to hold them. I've watched videos online, seen people (who claim to be parrot owners) try to pick my birds up, and watched people at the bird store trying to handle the birds. I have amassed many observations of people approaching parrots the wrong way and it won't step up or even bites. Meanwhile I could reach for the same parrot and it steps right up. It's not because the parrot has a specific thing for me and not them but rather because I've developed a universal approach to picking up parrots whether mine or other. 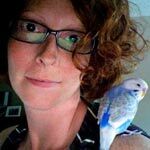 I was very disappointed not to have an article like this available to teach me how to hold a parrot when I bought my first and had no prior experience so I would like to share what I've learned with you. 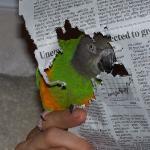 First and foremost, you don't want to leave a bad first impression on the parrot. Avoid making any sudden moves anywhere in the presence of the parrot. This includes both within sight and earshot. If you slam the door, even though your parrot may not have seen it, it may be in a nervous/jumpy mood and picking it up will be more difficult. Always err on the side of being too cautious because if you succeed in interaction, you can slowly be more and more abrupt/normal and it won't bother the parrot, but if you leave a bad first impression it may develop a fear of you. Give the parrot time to adjust at first sight. Don't go straight for the parrot after entering the room. Go about and do some things on your own and slowly work your way closer to the parrot. Of course if you have an existing relationship this may not be necessary but if you are visiting someone else's parrot or this one is new to you, these are definitely things you'll want to do. Now, once you have established a calm presence in front of the parrot, you can approach for the step up. At this stage the parrot might be on a stand, in the cage, or on someone's hand. It doesn't particularly matter what it is actually standing on as your approach should be roughly the same. Slowly walk toward the parrot watching for any signs of fear or aggression. Assuming the parrot is calm, proceed closer and closer. Stop and stand at half an arm's length from the parrot and reach your arm (right/left handedness doesn't matter, use what is convenient) away from the parrot at first. For small parrots reach out your index finger and tuck the rest of your fingers down. For a larger parrot use your wrist or entire arm. Aim the back of your hand toward the parrot so there is less available to bite or nip. Now from a distance your parrot will already see the cue for stepping up and it will come as no surprise that it is what you want. If the parrot is adamantly against this, you will know before your fingers are close enough to get chomped because you are taking your time approaching the parrot. Move the hand toward the parrot at a slow but steady pace. This way the parrot has time to think and act. Aim for just above the legs but don't hold your hand at beak height as that will encourage nipping. Parrots don't step down well so definitely don't aim at the feet or below. Once you are within beak length from the parrot, there is no backing down. Bite or not, at this point you have to bring the hand close enough for it to step up. If you back off at this point, the parrot will learn to bite whenever it doesn't feel like stepping up and you'll have a much bigger problem. The time for changing your mind was before you got close enough if the parrot was showing any aggressive body language. If the parrot does start to bite, keep pressing in toward the parrot and that will force it to step up and stop biting. By leaning into the bite you overwhelm the parrot and it should relax the bite. Assuming the parrot doesn't bite, once your hand is close enough it should step up. If it does not, continue moving your hand toward the parrot and gently press on the belly until it begins to lose its balance and is forced to step up. Once the bird is on your hand, be sure to move your arm slowly and gently the rest of the time because you don't want the parrot to develop a terrible association of being on you. As for grabbing a parrot, once again assuming the behavior is already learned by the parrot and it is strictly a matter of transferring to another person, use the same approach as for step up except swinging your arm from behind and slightly above the parrot. Keep your hand open with the thumb swung out to form a cradle that the parrot will be grabbed in. When you grab, squeeze from the sides onto the wings/shoulders but never hold by the belly because that will restrict breathing. Alternatively you can grab by the neck by holding your thumb to index finger together just under the beak. Not only does this keep the parrot firmly in your hand, it also prevents biting. This is a good grip to use for maintenance behaviors such as clipping nails or checking the wings. Don't actually squeeze the neck but rather make a circle between the thumb and index finger to keep the parrot from sliding out because the head is thicker than the neck. In conclusion, it is about having a collected and deliberate approach to holding the parrot. If the parrot is not afraid of you and senses that you will be picking it up no matter what, it is much less likely to refuse to step up than if you are shaky and uncertain. The parrot can tell all of this by how you move and act so be confident in yourself and don't be scared and you will be surprised by how much more cooperative the parrot will actually become. I say it's ok for a well trained parrot that is just being uncooperative but definitely not ok with an untame parrot that has no idea what you are doing. Positive reinforcement approach is definitely better. Great information. I plan to use that type of grip on my thumb from now on. I never even thought about that before you showed it here. Explains why I've had a few nips. I have never seen the neck hold before, but I really like that. I plan to try it on Sammy tomorrow. He's my "easy" bird. I can do just about anything to him already, so he's a good bird to practice on. Thanks for taking the time to create this video. Very good article Michael. It does sound weird that something like this isn't out there already. Just one little addition to the 'forced' step up when handling an untrained parrot. When it is sitting on a perch or some other area you can reach its feet easily. Approach the way you mentioned, but instead of pushing the belly you hook your finger under one of its toenails and move up slowly. The toe will move with your finger and the parrot will automatically step up. this way you avoid the scary off-balance feeling. 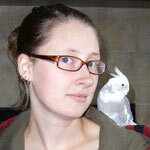 That's ok for like a baby or a very tame yet untrained to step up parrot. You're not going to be doing that to a vicious neglected parrot though. This will help me out TONS as of Wednesday. Thanks Michael ! 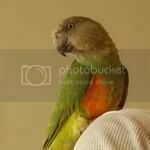 [quote="Michael":3obzf7wg]That's ok for like a baby or a very tame yet untrained to step up parrot. You're not going to be doing that to a vicious neglected parrot though. [/quote:3obzf7wg] True, I should have mentioned that. I had in mind a young handraised parrot and its first owner. Great article and video as usual, I just hope the message reaches all the people that it needs to... as your trip to the pet store showed.. Thank you for the article & video - very helpful! I can't wait until I have the trust and relationship with my bird that you have with yours. What if my conure refuses to step up, holds the bite and as I slowly push forward, he just decides to jump off the back of the perch?? I ask, cause thats what he does... Other than not wanting to step up, He always comes to the side of the cage to see me, eats from my hands, lets me pet his head (can't go near his belly), and we started stick/touch training. I suggest that you shouldn't do this to a bigger parrot like a eclectus . bindie my eclectus completly fliped and tried to bite me.